Space Travel Ride is a new kind of thrill ride that is designed by amusement rides manufacturers. We also call it the outdoor giant ride or the top spin ride. The whole equipment could rotate 360 degree which will give passengers the most thrill feelings that they will feel like they are wandering in the space. When it rotates to the top, the whole cabin will rotates with inertance. Generally speaking, there are 20 seat, and 10 seat in a row. This is one of the most thrilling amusement ride that is popular in the amusement parks. And it has drew lots of attentions from adults who loves enjoy thrilling feel. 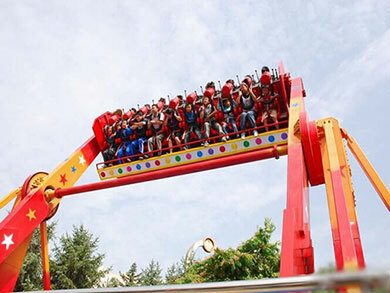 Kids who want to have a try on this thrill ride should be accompanied by their parents. 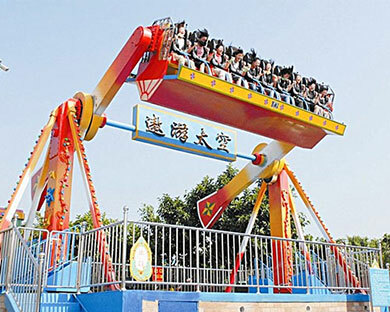 But this amusement ride is equipped with insurance devices and the cabin is equipped with seat belts, the key components have been made by nondestructive testing inspection. In Beston, the space travel ride could be painted with different colors according to the clients’ special request. The size and quantity of cabin could also be customize. Its speed and height of rising is higher than other observation wheel. But it is safe enough for kids and adults for Beston has professional designers and technician. Our giant space travel has advantage in quality and price.